This totally worked! I actually realised how much of what I eat is vegan anyway, so on days I wasn’t eating out/with friends a vegan day was no problem at all. No comment. This didn’t happen at all. Maybe next month? Yes! I started growing my own avocado trees (thanks for the guide Siobhan!) and I got some more plants at the nursery. It’s really addicting, so I can’t wait to buy some more. I’ve also gotten into the habit of buying fresh flowers every week and it makes my home such a happy place. With the heatwave last week I definitely made some iced tea. Just very simple with earl grey tea and some lemon. Do you have any favourite recipes? 3 out of 5 – not too bad, right? 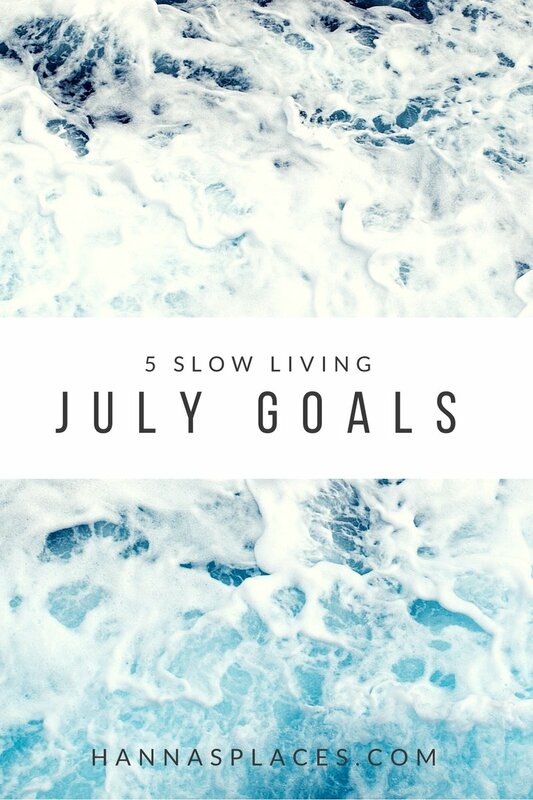 And now: 5 slow living goals for July! I’ve started to eat at the table, without the TV or my phone nearby this week and it’s so hard! I don’t really want to admit how difficult I find it to do nothing besides eating – no scrolling through Instagram, no e-mail, nothing. I really hope this gets better over time, we’ll see! I have gotten about 5-6 hours of sleep every night lately. Not completely catastrophic, but I’ve noticed that I’m tired all day every day as well as quite addicted to coffee again. I want to go to bed grandma-early and wake up refreshed every morning. I feel like time is flying by so I want to be able to remember it in some way and reflect on the days. It needs to be something simple though, maybe a gratitude journal? Any tips? I’m going back to Uganda in two weeks and I seriously can’t wait! Just like last time, I want to stay away from the phone and internet completely. Another one that will be quite hard actually. I want to stop looking at my phone while watching Netflix and actually only do one thing at a time. Maybe this way I’ll actually remember what I’m reading/watching on TV! These are my five slow living goals for the month. Nothing ground-breaking, but essential habits for a happier life I think. Did you try implementing these? Did it work? Let me know if you have any tips!